The ‘Museo Nacional de Bellas Artes de La Habana’ is, in my opinion, a must see. You can’t imagine the quantity and quality of works that are under this roof. I suggest you set aside at least a couple of hours for this visit if you want to see it somewhat properly. Being a little more than a tourist and through my Blog I’ve discovered that the art world in Cuba is more than those paintings we see peddlers selling on the streets but I couldn’t imagine the scope of what I would find within the walls of the Bellas Artes. The building that the Museum is housed in now was inaugurated in 1954 but it’s not the original building that was used. There are two buildings (since 2001), one dedicated to Cuban art & the other ‘Palacio del Centro Asturiano’ to universal arts….this post is about the Cuban Art building. The museum exhibits Cuban art collections from the colonial times up to the contemporary. The original institution was founded on February 23, 1913 by its first director, Emilio Heredia Mora (1872-1917). Two years after his plea for donations on November 1, 1910 in the newspaper La Discusión, support from public & private sectors (artists and collectors…) donated the initial core of their collection. 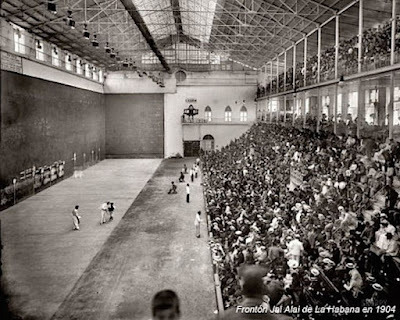 The first location for the Museum was located in a building known as the Antiguo Fronton on the corners of Calle Concordia y Lucena in Centro Habana where previously Jai Alai or Basque Pelota was played. In 1954 the Museum moved to it’s current location, it was designed by the Cuban architect Alfonso Rodriguez Pichardo….it features an inner patio with a fountain in the center. The “Arte Cubano” building is home to in the upwards of 30,000 artworks of which 940 pieces are on permanent exhibition. The three exhibition floors are divided into six sections: Colonial Art (16th – 19th century), Turn of the Century (1894-1927), Emergence of Modern Art (1927-1938), Consolidation of Modern Art (1938-1951), Other Perspectives of Modern Art (1951-1963), and Contemporary Art (1959-present day). On the main floor you’ll find an eatery that serves up light fare and a shop that sells books, magazines and reproductions of some of the more important artworks displayed in the museum. There are way too many pictures to attach to one post so I will split the artworks into two postings….and I still have to many pictures. This post will feature pieces before 1959 and the next one will be art produced after the current revolution.